The Panasonic GH5 really forced a change in the way I think about the term “video camera.” For me and the way I’m shooting these days, it bridged a gap existing between the compromise of a lightweight DSLR/mirrorless camera or a cumbersome cinema camera. 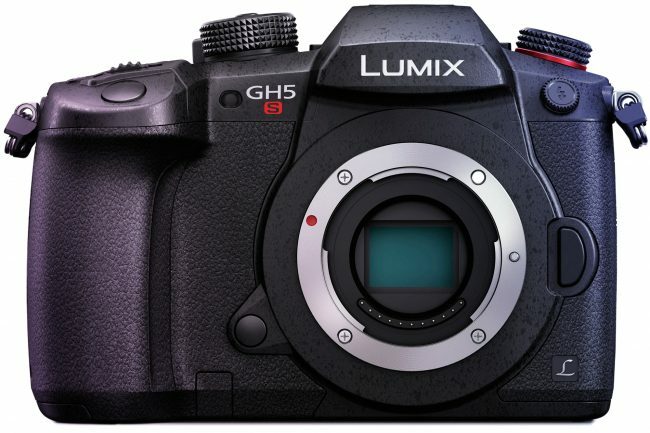 The GH5 was a camera that looked too good to be true when scrolling down its lengthy prerelease specs list. Do you want 4K 10-bit 4:2:2? You got it. Have a desire to shoot 6K anamorphic? Ok. Are you chasing that 4K 60fps dragon? Panasonic delivered and flew straight to the top of nominations list for “Best Specifications in a Compact Video Camera,” a prestigious, yet utterly fictional award that exists solely in my imagination. We’re a year into the life of the GH5, and its designers have fulfilled promises of free feature upgrades that met or surpassed most expectations. So, what is the one area that even GH5 evangelists have to agree isn’t perfect? If you said “the lack of timecode in/out via BNC,” I’d have to say you’re in the minority, but Panasonic somehow heard your singular voice through the cacophony of users wanting increased low-light sensitivity. While the Panasonic GH5 offers more than many in the way of ISO performance, I had resigned to the notion that low-light shooting is just something you give up when working with Micro Four Thirds systems. Then, the Panasonic GH5S stepped out of the shadows in an attempt to change my mind. Much the same way that Sony created the low-light champion A7S II, Panasonic used a sensor with less, larger pixels to soak up more of the light available in a poorly naturally lit scenario. This has the benefit of creating a brighter image and freeing up some processing power, but the side effect — in both the Panasonic GH5S and Sony A7S II — of reducing the resolution of the sensor. In the case of the GH5S, the resolution is lopped nearly in half. The extra resolution was mostly lost on video users, but the most substantial casualty of lost pixels is the relatively niche but pretty cool 6K anamorphic mode. Let’s just get down to it with comparison photos of the GH5S and GH5 field of view. To explain the setup, the GH cameras are compared with a Panasonic Leica 42.5mm f/1.2 OIS wide open recording DCI 4K 400Mbps video with V-Log enabled. Before we get to discussing image quality, I was surprised at how much the field of view widens with the new, multi-aspect sensor. The Panasonic GH5S uses a lot more of the available Micro Four Thirds image circle by maximizing the sensor area of each aspect ratio where the GH5 crops tighter and tighter into the 4/3 sensor aspect ratio to render wider video formats. See my crudely-rendered illustration below for a visual aid. For those hoping the GH5S lives up to its marketing, I can say the difference in ISO sensitivity is immediately visible. Even at low ISO settings, V-Log shows all of the ugly noise hidden in the shadows, and there is much less of it with the GH5S. With V-Log enabled, zero gain or native ISO is found at 400 ISO on the Panasonic GH5 and 800 ISO on the Panasonic GH5S, but the GH5S has a new feature Panasonic calls dual native ISO. You’ll see in the comparison video below that noise builds in the GH5S image until 3200 ISO where it is reduced by some wizardry. In a sentence, Panasonic engineered a second native ISO to take over at 2500 ISO and swap around some circuitry before the sensor data hits the gain processor. You, or I for that matter, don’t have to know what that means to see a huge reduction in the visible noise of the image. 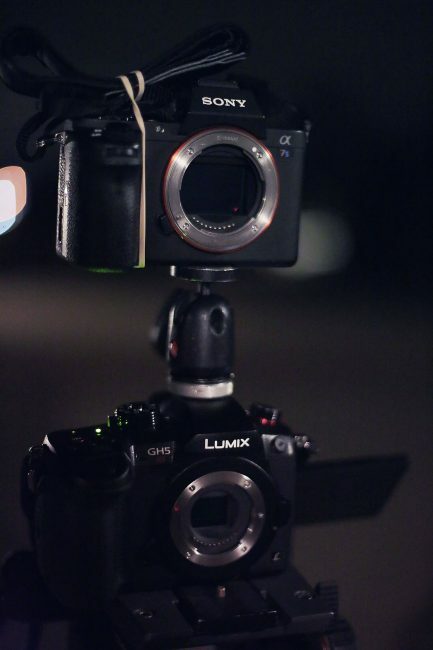 This also lets Panasonic push the maximum ISO much further. In the comparison, you can see the GH5S low-light image quality speed ahead of the GH5 from that point. So much so that when pushed all the way to the new maximum of 51,200 ISO, the Panasonic GH5S has an image that appears cleaner than the previous Panasonic GH5 max of 12,800 ISO. It’s remarkable that they have squeezed so much out of this MFT sensor. Also worth noting is a reduction of the nasty, yellow color shift that plagues GH5 images captured beyond 1600 ISO. Download the uncompressed version here. The GH5 isn’t hard to best in low-light, so let’s bring out a more competent challenger. Comparing the GH5S directly to the A7S II isn’t really a fair fight, so I thought it’d be more interesting to see how close I could get to matching Sony’s low-light monster with any and all help I could find on the LensRentals shelf. In this case, I used a Metabones EF to E T Smart Adapter IV to set up the Sony A7S II with a Canon 50mm f/1.2L. I did the same with the GH5S with the distinction of using a Metabones EF to MFT Speed Booster XL. If you’re not familiar with this particular product, it adds a couple pieces of glass into the adapter working between a full frame lens and a crop sensor camera to recapture some of the lost focal length and in turn the light that would be hitting a full frame sensor. In this case, it’s a reduction of .64x for an effective crop factor of 1.28x. The Panasonic GH5S puts up a good fight but, even with help from a speed booster, falls a little short. 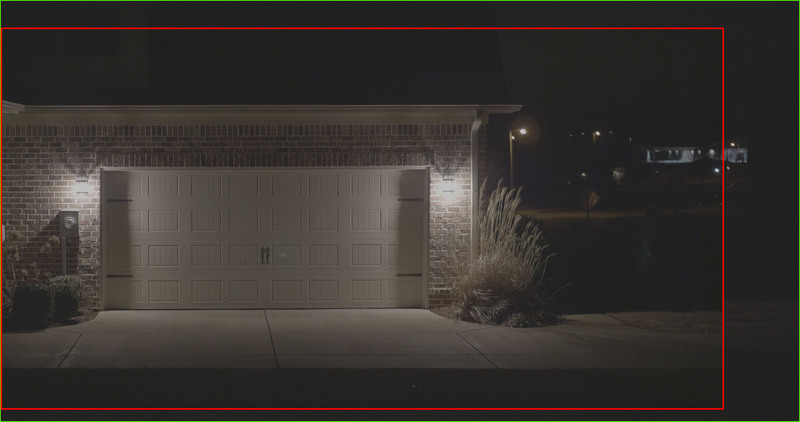 The Sony A7S II starts at 1600 ISO in SLog, and when comparing the two cameras at that sensitivity, noise on the GH5S is more evident in the shadows. The shadows of the GH5S appear to be more exposed most likely because of the differences in SLog 2 and V-Log. Despite the A7S II handling noise a little better across the ISO range, I prefer the color rendering of the GH5S in these examples in my experience. Colors on the Panasonic GH5S are more natural and consistent. This is no doubt thanks to the much higher bitrate of internal Panasonic codecs. The GH5S does remain competitive in these comparisons up to its max ISO, but when GH5S runs out of track, the Sony A7S II keeps on chugging. I don’t push camera ISO hard enough to need that extended range, but if you do, the A7S II is still your go-to camera. The new sensor is the main event, but I’d be remiss if I didn’t at least briefly mention my thoughts on other changes that have been made here. While I understand the necessity for the change, losing the in-camera stabilization hurts. The GH5’s sensor stabilization is the only in-camera or lens stabilization I regularly recommend to our video customers. For handheld, compact shooting situations it was a life saver, but it’s out on the Panasonic GH5S because even while turned off, the sensor can still jiggle during instances of heavy shock. That just doesn’t work for professional shoots where a rock-solid image is required. It would have been nice if Panasonic could figure out some sort of sensor lock solution, but that would require room for the mechanism, an even larger sensor, and add to the cost of a camera that is already $500 more expensive than its predecessor. The $500 upcharge does get you built-in V-Log, and it’s needed to get the most out of the camera. There are no recording resolutions higher than DCI 4K with the new sensor, so your 6K anamorphic video and higher resolution photos are relegated to the GH5. A lower resolution on the new camera does allow for slow motion video up to 1080p 240 fps. It’s achieved by cropping the sensor, so quality is reduced. Pull that back to 192 fps to utilize the full sensor, but even then footage appears to be more aliased than that of slow-motion GH5 video. The last major change is timecode in/out via the flash sync port. It works, and while it will probably be beyond the needs of most of our customers, I’m sure the news made someone’s day. I wish summarizing this review were as easy as saying, “If you like shooting video on a GH5, this is the camera for you,” but it’s not so simple. I can say I don’t recommend this camera if you’re primarily a stills shooter. You get 14-bit raw stills but at a resolution that can be easily beat by cameras half its price. This is a great upgrade or even entry into M4/3 video for anyone who is not relying on the in-camera stabilization for handheld video. The lens selection is superb and growing every day, and you will not find a M4/3 camera that works so well in such varied lighting situations. As a heavy user of the Panasonic GH5, I will be moving my primary shooting to the Panasonic GH5S. sorry! hardly on topic, but needs must where the devil drives! But I’d like to throw a spanner in the works. I recently shot some two camera interviews. Running into two identical Atomos Ninja Infernos, using my two GH5Ss , two Metabones x.64 speed boosters and a Canon 24mm f1.4 and a Canon 85mm f1.4, both had identical ISO, shutter speed/angle and f stop on the initial set up, and I noticed an exposure variance of about half to two thirds of a stop. Odd I thought. I assumed that the standards would not let this happen. When I checked the set up with a Zeiss 18mm f3.5 there was profound difference, nearly two whole stops. If I swap the lenses over between the cameras with the exact same settings, there is no variance at all in the exposure. Go figure! I then did a stills test on my 5D MkIV, again all identical settings (f3.5, 50th, 250ISO) and all three exposures were near identical. Any ideas why the GH5S/Metabones/Canon-Zeiss lens set ups might not provide identical exposures with identical set ups? Am I doing something wrong (has been known) or am I going to have to make manual adjustments on each two camera set ups in the future? Looks like a great camera if you need the low light capability and are already invested in M43 lenses. Please do! No BS videos with easy to see differences between lenses and bodies would be incredibly helpful to all of us. Most of us have to get by with whatever folks make and post on YouTube, and those guys have highly variable levels of expertise. Heck, if I was in Tennessee, I’d pitch a videographer / video editor social media / content marketing package to do it for you! I’ll make sure the blog editor reads this. Video content is much more time intensive in my personal experience, but that’s definitely an area where we have some built in resources that could make for interesting content. I subbed to your channel. I’d love to see more content like this in the future! You guys are well-positioned to make great educational comparison content because of all that gear you own! I hope to see more like this someday! Nice! Thanks for sharing this. The comparison is great, and weirdly, one I haven’t really seen in the wild, done so quickly and simply. Great work! Sony FS5/7: I don’t like slog. Exposure has to be near perfect for me to get a good grade from internal FS5 codecs. Easier with the FS7 because of more latitude from the higher bitrate codec, but even then, colors for me aren’t as vibrant without a lot of work. Raw is where these cameras excel and will outshine the GH5 cameras. Canon C200/300: I find the color reproduction on these Canon cameras to be slightly more accurate, but also slightly more time intensive to grade. Using the C200’s “raw lite” is going to get more latitude in post than a GH5 at 2.5x the data rate. Canon Log is good and you’re going to get more light into the camera with their bigger sensors. Alexa: I’ve only used the Alexa Mini and Amira, but since they use the same sensor tech, I can probably make pretty good assumptions toward the base Alexa. Arri footage for me grades much the same as Canon, but the thing that makes the Arri image distinctive is the highlight rolloff. The GH5 can’t compete with the dynamic range and highlight rolloff there. Arri upscales their 3.2K sensor to 4K, but using ARRIRAW in camera puts it at a distinct advantage regardless. tldr: Yes. In controlled shooting conditions, I think a GH5 can get you to Sundance. Strictly from the perspective of image quality and gradability, how do these two cameras compare to something like a C200/300 or an F5/7? Using a percentage scale, how close is it to the plain vanilla Alexa? Is it 80 percent of the way there? 40 percent? I didn’t do a direct comparison between the base GH5S and A7S II to save on article clutter, and because YouTube has already covered it pretty thoroughly. Objective info is great, but I don’t have a good way to measure grain for my at home tests. I hope the bulk of the objective info can be gathered from the videos I link. Stacking two cameras I’m comparing just makes the whole gathering footage and editing process so much easier. I wouldn’t recommend it for normal use, but it gets the job done when you need it. Seems like you might be “living the dream” … paid to play with latest/greatest photo/video equipment. I would have been interested in comparisons of the native GH5s vs Sony a7S2, without the MetaSpeedBooster. And objective info would be helpful, if feasible, rather than subjective. Not an option? Something I’m curious about … there’s an image of the GH5s on a tripod with the Sony looking precariously mounted with a “Rube Goldberg” looking adapter between them in the hot-shoe of the GH5s. Did you actually do some testing with that setup? The text didn’t mention why the image was there. Seems like a Bad Idea (“because we can” idea from crazy Roger C?) … especially once fast/heavy lenses would be mounted like the Canon f/1.2 and MetaBooster. That is indeed a typo. Thanks for the heads up. I didn’t dive into the photo modes for this article, but other sources report the GH5S is 2 fps slower than the GH5 (12-bit raw) when using the new 14-bit raw mode. 14-bit? Hows the buffer compare to the GH5? Did they keep the same size so it’s effectively doubled?